Yessss! 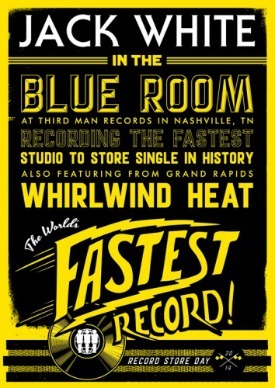 Jack White is coming out with some new music on April 19. Here’s the kicker: he’s going to record it at 10 am, making a limited edition version of the title song from his new album “Lazaretto,” then it’ll be immediately made into records (like actual records), then the 45s will be taken back to Third Man Records in Nashville and sold to fans on the spot. “As long as there are fans in line waiting to buy the single, United will continue to press and deliver them to Third Man to sell. Even if it takes all day,” it says on the Third Man website. Fans can buy tickets to watch it all go down and hear what could be the final concert for Whirlwind Heat (will they re-enact this video?!). Jack White has done some creative things with his music in the pastwhether it’s being part of the White Stripes, live streaming his Gary Oldman-directed concert for Yahoo, or making some amazing music videos. But this is an attention-grabbing stunt that is part inspiration and part industry mandate. He’s not the only one pulling out all the stops to get attention in a music industry where just selling records is now not enough. Wu-Tang Clan is putting out two records this year — the first an anniversary album called “A Better Tomorrow,” the other a new album called “Once Upon a Time In Shaolin.” They plan to only make one copy of the latter, travel with it, having fans pay to listen to it, and then sell one special copy to the highest bidder. RZA says they’ve gotten a bid for $5 million. Then, of course, there was Beyonce’s self-titled “visual album” that surprised everyone late last year by being released with no advanced notice and complete with a music video for each track. The Black Keys did this psychedelic madness and made us all freak out (and maybe take off our pants or something) to launch their new kickass song. And Prince used his love of the show New Girl to make a post-Super Bowl appearance and debut a song from his upcoming album. So artists have to be more and more artistic to make a splash. Also, they have to make great music.